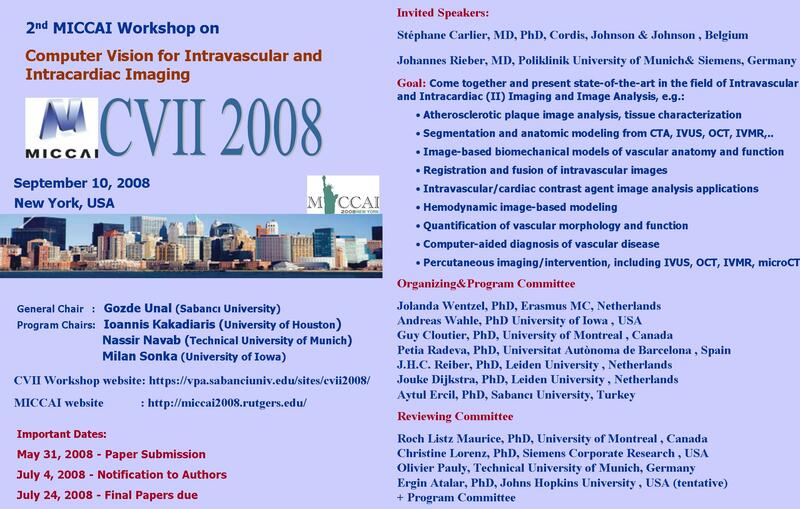 Segmentation and anatomic modeling from CTA, IVUS, OCT, IVMR,..
Paper submissions are to be made electronically (via email to gozdeunal sabanciuniv.edu) in pdf format. Papers must be submitted in LNCS style, prepared for double-blind review, and may be up to 8 pages, including all references, tables and figures. Please follow the guidelines of MICCAI. Accepted papers will first appear in a Workshop CD. The organizers are working to arrange a Springer LNCS book to include selected and expanded papers from the workshop. Dr. Stéphane Carlier, MD, PhD, Director of Intravascular Imaging & Physiology at the Cardiovascular Research Foundation® and the Center for Interventional Vascular Therapy at Columbia University Medical Center (CUMC). He also is an Assistant Professor of Medicine at CUMC. A recognized innovator in the field of biomedical engineering, Dr. Carlier previously worked as an interventional cardiologist in the Cardiovascular Centre in Aalst, Belgium, where he was in charge of the intravascular ultrasound (IVUS) laboratory. Dr. Carlier also worked in the catheterization laboratory at the Thoraxcentre, Erasmus University of Rotterdam, for 5 years and took part in the pioneering European clinical trials on drug-eluting stents and brachytherapy. Dr. Carlier completed medical school in 1991 at the Free University of Brussels. His internship, residency and cardiology training were performed at the St. Pierre University Hospital, also in Brussels. In 2000, Dr. Carlier defended his thesis on new processing methods of IVUS images for his PhD in bioengineering, which he earned at the Thoraxcentre, Erasmus University of Rotterdam. Dr. Johannes Rieber completed medical school in University of Munich. He has been in Munich and Radiology Department University of Munich; Department of Radiology, Massachusetts General Hospital; Harvard Medical School; Consultant Cardiology, Medizinische Poliklinik University of Munich. He is an Associate Professor in Medicine, University of Munich. His interest areas are cardiac CT and MR, invasive techniques in cardiology, functional measurements in the cathlab, computers in cardiology. He is a member of German Society of Internal Medicine, German Society of Cardiology, European Society of Cardiodiology (Board certified European Cardiologist), Working group on Coronary Flow and Coronary Microcirculation and Intravascular Ultrasound and Working group on Health Technology assessment and decision analysis.